Did you clean the sink? When I was growing up, I hated washing dishes. I especially hated it when there were pans to scrub and pots to soak. But washing dishes after dinner was one of my assigned chores. I wish I could say I happily washed away thinking my hands were getting softer like Madge’s clients in the old Palmolive soap commercials. Instead, I grumbled, gagged, and hurried my way through the chore just to please my mom. The problem was, I never pleased her. “Mom, I finished the dishes!” I always proudly proclaimed. Her immediate response was always the same. Couldn’t she just ever acknowledge I did the dishes? Did she always have to indicate I didn’t do it right? I always groaned and went back to scour the sink with Comet. I don’t know why I didn’t make the Comet cleaning part of the job because I knew she’d ask! But, that’s not what teenagers do. They try to get away with doing the least amount of work. 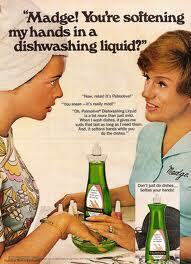 A few years later, a church commercial came on TV that showed a proud daughter telling her mom she cleaned the sink. I glared at my mom. She glared back at me. Now that my daughters are home for the summer, I’m trying not to be that mother from that old commercial — the one that ignores the accomplishments. So when they happily do the dishes (insert sarcasm here), I go into the kitchen and rinse out the sink. Then, I wipe off the table, and get the kitchen back to my standard of clean. I appreciate it when they help with the grocery shopping, the cooking, the cleaning up. Having grown up daughters is great that way!